* Read-only. The length of the ArrayBuffer (in bytes). * Returns a section of an ArrayBuffer. Typed Array 表示的是一簇类，它们的 API 相似的, 且它们的实例都是 array-like 的. * number of bytes could not be allocated an exception is raised. 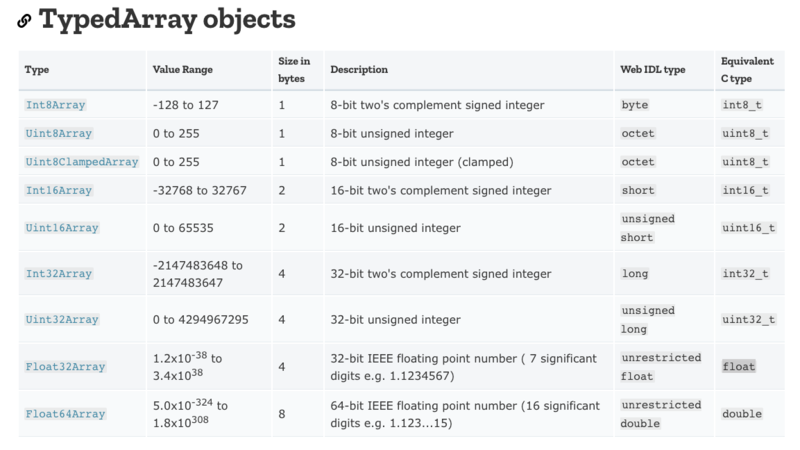 * The size in bytes of each element in the array. * The size, in bytes, of the data contained in the Blob object. File 继承于 Blob, 多了 一些属性，其内容一样无法修改. * Raw data is stored in instances of the Buffer class. * a raw memory allocation outside the V8 heap. A Buffer cannot be resized. 最后我们还要提一下 FormData 这个类。其实大家并不陌生，浏览器做 form 提交时, 给后台发的 http 请求的格式就是 multipart/form-data, 此时 http body 里的内容就是一个 FormData 对象。有趣的是 Node.js 没有这个类。那么在 Node.js 里去模拟一个 form 提交岂不是搞不了?! 我们能否自己用 Node.js 来实现一个兼容 Web FormData 的类呢？上面的声明中 Blob 和 File 在 Node 里是没有的，但是 Buffer 在 Node 是可以用来描述未加工的 (raw) 内存的，所以理论上可以用 Buffer 去描述任何内存块。说说容易，真的实现这个描述还是千难万难的，所幸 alex indigo 已经做到了，他提供了 form-data 库来让我们在 Node 环境里创建一个可以用于 form 提交的 form-data.